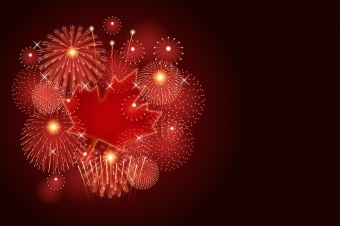 Fireworks are synonymous with our celebration of Canada Day. Yet, the thrill of fireworks can also bring pain. According to the National Fire Protection Association (NFPA), fireworks cause an average of 18,500 reported fires per year in Canada. Moreover, about 9,300 people per year receive treatment for serious fireworks injuries. The safest way to enjoy fireworks is to attend public displays conducted by professionals. However, if you want to use fireworks yourself, always make safety your number one priority. Follow the tips below to stay safe with fireworks. Obey Firework Laws. The laws and regulations regarding the use of consumer fireworks in each province vary, so purchase products that comply with your province, city or town's rules. Buy only legal fireworks. Legal fireworks have a label with the manufacturer's name and directions. Don't buy fireworks packaged in brown paper - they could be made for professional displays. Illegal fireworks are unlabeled and their names include M-80, M100, blockbuster, and quarter pounder, among others. Although they were banned in 1966 for safety reasons, people still use them. Keep fireworks safe and dry. Store fireworks in a plastic or metal container with a secure lid. Keep the container outside your home and away from living areas. A locked storage shed is ideal. Make sure the storage area is cool and dry, and that fireworks aren't close to heat sources. Read the instructions and safety precautions. Only adults should use fireworks. Never allow children to handle fireworks, including firecrackers and sparklers. Sparklers burn at about 2,000 degrees, which is hot enough to melt some metals, and account for more than one-quarter of emergency room fireworks injuries. Don't use fireworks if you have been drinking or are chemically impaired in any way. Use fireworks outside, in a clear area, and away from homes, trees, vehicles or other objects. Postpone your fireworks display if it's windy. It can push sparks into nearby buildings, trees or grass, and cause fires. Gusts may endanger you and your guests if sparks fly towards you. Don't hold fireworks in your hand or place any part of your body over them when lighting the fuse. Don't carry fireworks in your pocket as friction may set them off. Never shoot fireworks in plastic, metal or glass containers. Never throw or point fireworks at someone - they may backfire or steer in the wrong direction. Spectators should keep a safe distance from the shooter. Light one firework at a time, then move back quickly. Don't try to relight or handle malfunctioning fireworks or pieces of fireworks as they may explode at any time. Discard spent fireworks safely. Wait 20 minutes after lighting, then soak firework duds in a bucket of water. Place the wet duds in a metal trash can away from buildings or combustible materials until the next day. View fireworks from a safe distance - at least 500 feet away from the launching site. Obey safety barriers to allow pyrotechnicians to do their jobs safely. Follow directions given by the event ushers or public safety personnel. If you find unexplored fireworks remains, don't touch them. Contact your local fire or police departments. If you get injured by fireworks, seek medical help immediately. Don't bring your pets to a fireworks display. Animals have sensitive ears and can easily get scared by loud noises. If fireworks are being used near your home, put your pets in a safe, interior room to avoid exposure to the sound. Play some comforting music and give toys to play with, to help distract them. Make sure your pets wear ID tags even if you keep them at home because they may run off due to fireworks. Remember - by using fireworks, you may put yourself and others at risk. Apply these guidelines before igniting fireworks so that you and your guests can remain safe.